Situated just off England’s south coast, the Isle of Wight is littered with picturesque villages and bustling small towns. The island is the perfect destination whatever the time of year as attractions and places to visit are in plentiful supply, there are award-winning beaches, shopping opportunities, outdoor activities for all, areas of outstanding natural beauty, a host of local wildlife and dinosaur heritage to discover. The capital of the Isle of Wight, Newport, lies at the heart of the island and is a great place for shopping; offers a good range of entertainment; has a selection of attractions such as the Museum of Island History, Quay Arts Centre and the Newport Roman Villa; and is where the isle of Wight Festival takes place every June. Ryde is actually the largest town on the island, and with its ferry links it is often referred to as ‘the gateway to the island’. In addition to an expanse of sandy beaches, Ryde has a great selection of boutique shops, museums and galleries to visit. Popular seaside resorts on the island include Sandown, which has long stretches of golden sandy beach and a Victorian pier, making it ideal for families with young children; Shanklin lies to the south of Sandown and is famed for its beautiful beaches and sub-tropical gardens; and the charming town of Ventnor, a Victorian health resort, which is set on a hill and has vintage shops along with a sheltered beach and peaceful Botanic Gardens. Inland, you can potter through picture-postcard villages, or perhaps hire a bike and pedal along the country lanes where you’re surrounded by greenery, gently rolling fields, woodlands and quintessential English thatched cottages. The island’s coastline is also not to be missed with its dramatic cliffs, long and hidden beaches, quiet estuaries and stunning views across the countryside and beyond. 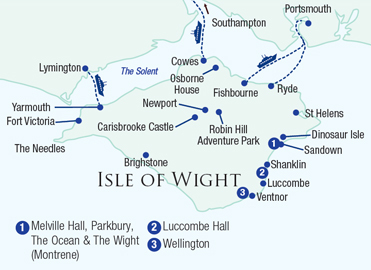 Places to visit include Osborne House, the favourite retreat of Queen Victoria and Prince Albert; Carisbrooke Castle, best known as the place where King Charles I was imprisoned; Yarmouth Castle, an atmospheric 16th century castle; Dinosaur Isle, Britain’s first purpose-built dinosaur museum; and Needles Park, famed for the coloured sands at Alum Bay and the sand cliffs which overlook the island’s most famous landmark – the Needles Rock and lighthouse. Our vastly experienced travel advisors are passionate about the Isle of Wight Holidays. With first-hand knowledge of when and where to go they can create the perfect holiday experience for you, at the best possible price. Geography: Lying 5 miles off the coast of Hampshire separated by the Solent, the Isle of Wight is a county of England and England�s biggest island, it is 23 miles long by 13 miles wide. Travelling times: There are a variety of routes to reach the island, including the car ferry between Portsmouth and Ryde, the foot passenger catamaran from Portsmouth Harbour to Ryde and a second ferry route between Lymington in the New Forest and Yarmouth. Transfer times: On an island the size of the Isle of Wight, you won�t be surprised to know that most hotels are no more than 30 minutes from the main ferry ports.